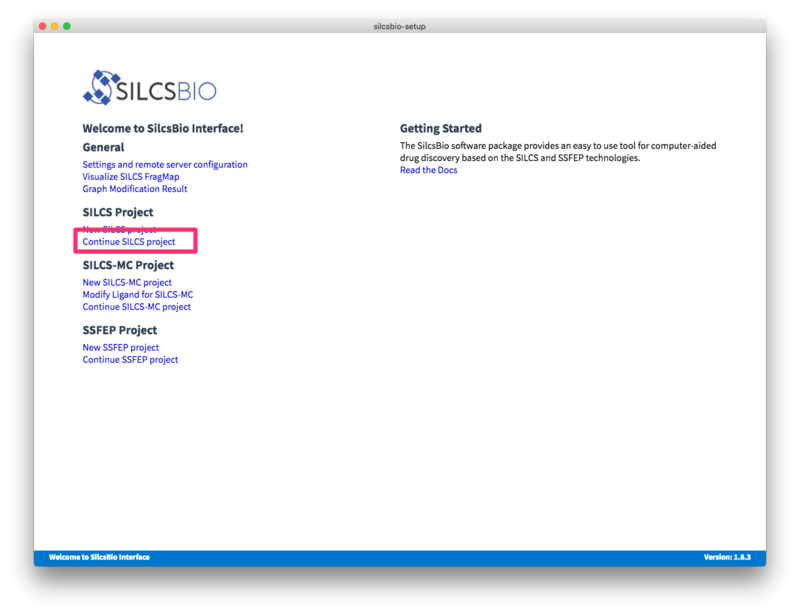 The purpose of this document is to provide a step-by-step guide on how to use the SilcsBio Graphical User Interface (GUI). For more detail, please read the rest of the user guide. The SilcsBio GUI is designed to work with the server installation of the SilcsBio software. Therefore, the remote server needs to be configured to properly use the GUI. When you launch the GUI, select Settings and remote server configuration menu. 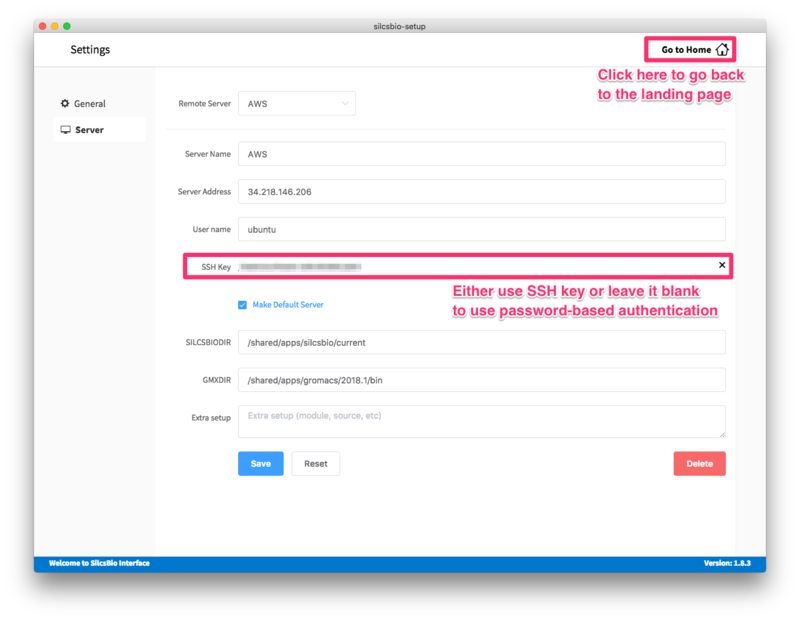 Within the “Settings” page, select the “Server” menu and enter the remote server information, such as server address, username, and an SSH key to the server. If you do not have an SSH key to the server, leave it blank. The GUI will ask you the password to the remote server instead. Select “Make default server” checkbox if you would like to set this server as your default server. This server will be selected as a default in other parts of the interface. You will also have to enter SILCSBIODIR and GMXDIR information in the bottom of the page. This should match the settings on the remote server. Please contact us if you need a help on these variables. Once the information is added, click the “Save” button to save the information about the server. The interface will test the connection and store the information. Select New SILCS project from the home page. Enter a project name, select remote server, and select project location from the remote server. The project location is where the SILCS simulation will be performed on the remote server. Typical SILCS simulations produce output files in excess of 100 GB, so please select a folder with appropriate storage capacity. Next, select a protein PDB file. 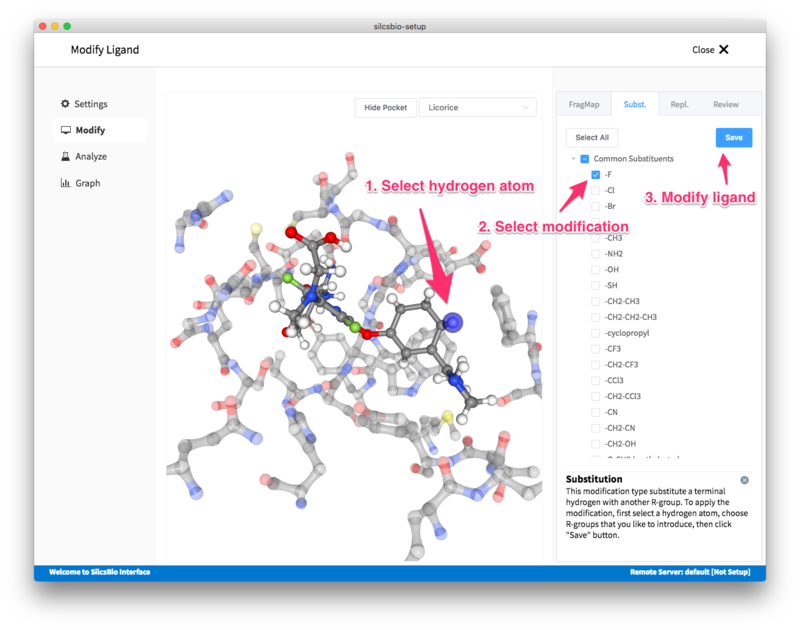 We recommend cleaning up the PDB before use in SILCS, incuding keeping only the protein chains that are necessary for the simulation, removing all unnecessary ligands, renaming non-standard residues, and filling in missing atomic positions. If the interface detects missing non-hydrogen atoms, non-standard residue names, or non-contiguous residue numbering, it will inform the user and provide a button labeled “Fix?”. 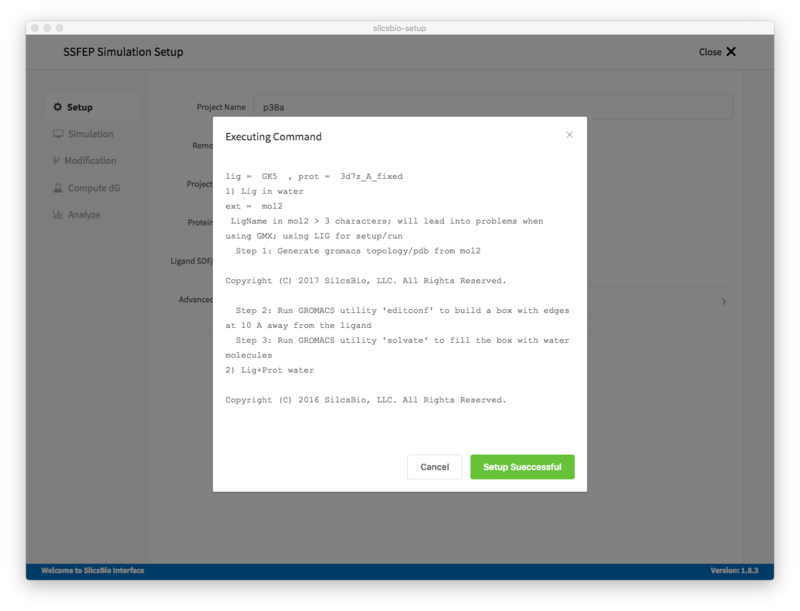 If this button is clicked, a new PDB file with _fixed added to the base name will be created and used in the SILCS simulation. Once all information is entered correctly, press the “Setup” button at the bottom of the page. 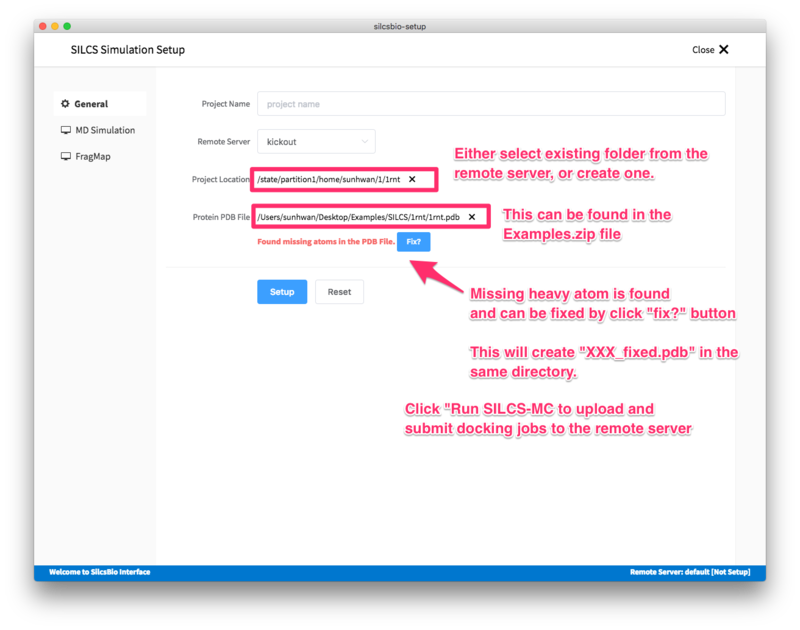 The interface will contact the remote server and perform the SILCS GCMC/MD setup process. During setup, the program automatically performs several steps: building the topology of the simulation system, creating metal-protein bonds if metal ions are found, rotating side chain orientations for enhancing sampling, and putting probe molecules around the protein. To complete the entire process may take up to 10 minutes depending on the system size. A green “Setup Successful” buton will appear once the process has successfully completed. Press this button to go to the next step. 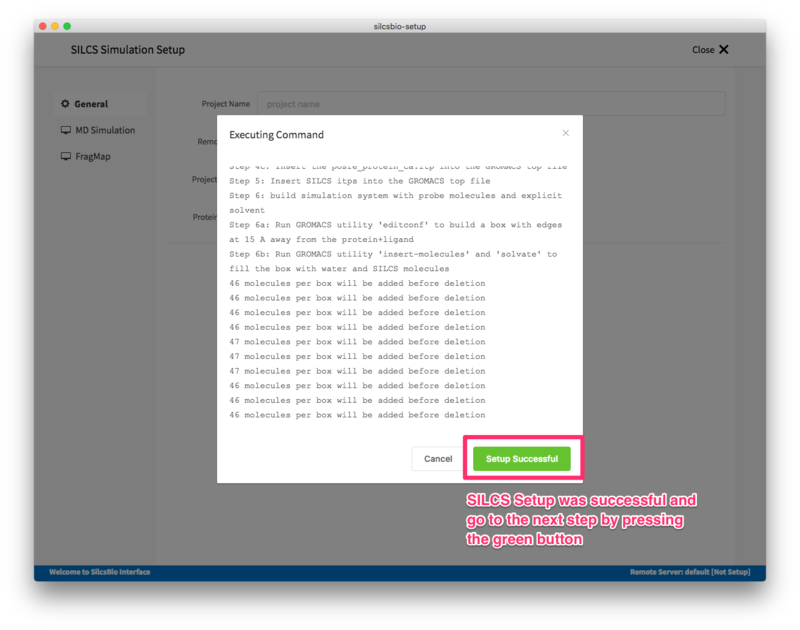 Your SILCS GCMC/MD simulation can now be started by clicking the “Run SILCS Simulation” button. Before running, you may wish to double check that you have chosen the desired directory on the remote server and that it has appropriate storage space. 10 jobs will be submitted to the queueing system. Job progress will be displayed in this same window. The status of the job is also shown next to the progress bar: “Q” for queued, “R” for running, and “E” for finished. To see a full listing of all of your projects, select Continue SILCS project from the GUI home page. This will show a list of all SILCS projects on your local machine as well as their status. To resume work on a project, simply click its name in the list. Once the simulation is finished, the GUI can be used to create FragMaps and visualize them. If you plan to compare FragMaps from two different protein structures, you will want to generate them with the same orientation. In that case, pre-align your input structures with each other and use these aligned coordinates as your Reference PDB Files. For additional details, please see Site Identification by Ligand Competitive Saturation (SILCS). Select New SSFEP project from the home page. Enter a project name, select remote server, and select project location from the remote server. The project location is where the SSFEP simulation will be performed on the remote server. 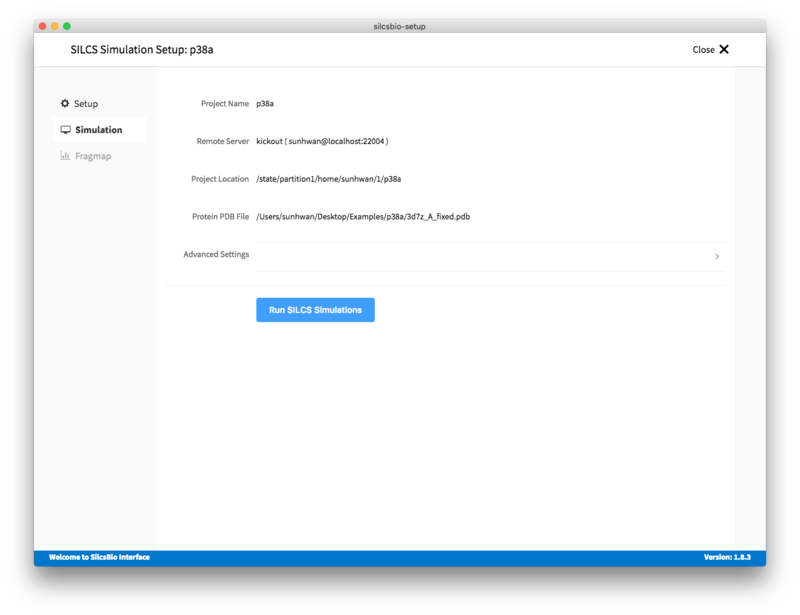 Typical SSFEP simulations produce output files in excess of 20 GB, so please select a folder with appropriate storage capacity. Next, select a protein PDB file and a ligand file. The ligand should be aligned to the binding pocket in the accompanying protein PDB file. 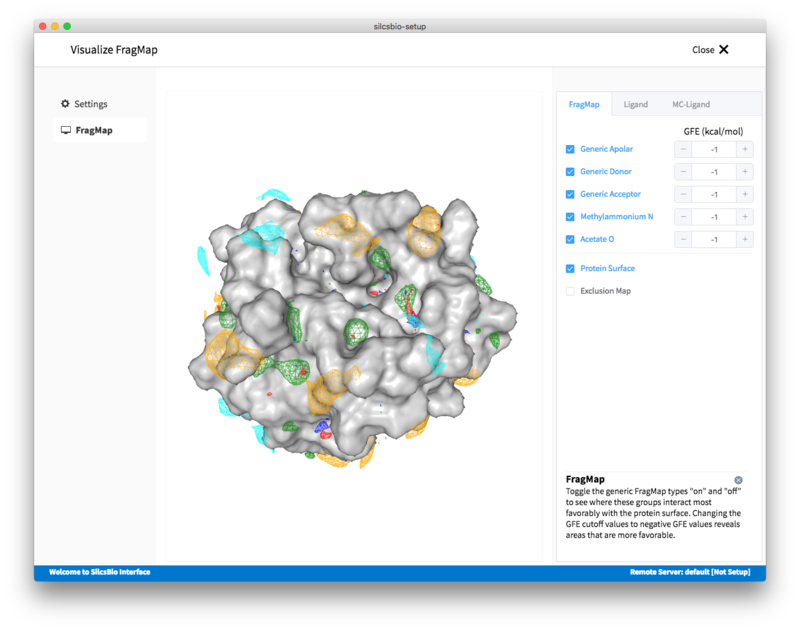 We recommend cleaning up the PDB before use in SSFEP, incuding keeping only the protein chains that are necessary for the simulation, removing all unnecessary ligands, renaming non-standard residues, and filling in missing atomic positions. If the interface detects missing non-hydrogen atoms, non-standard residue names, or non-contiguous residue numbering, it will inform the user and provide a button labeled “Fix?”. 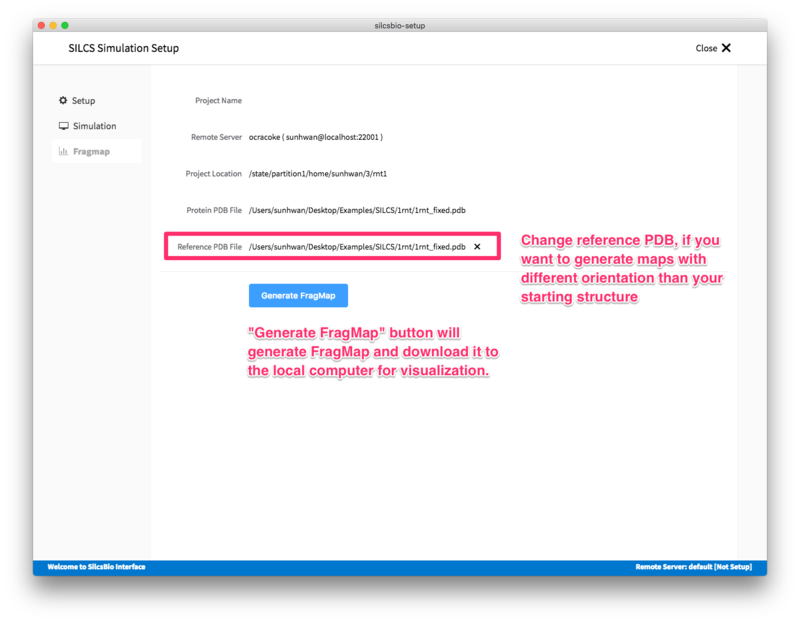 If this button is clicked, a new PDB file with _fixed added to the base name will be created and used in the SSFEP simulation. Once all information is entered correctly, press the “Setup” button at the bottom of the page. The interface will contact the remote server and perform the SSFEP setup process. 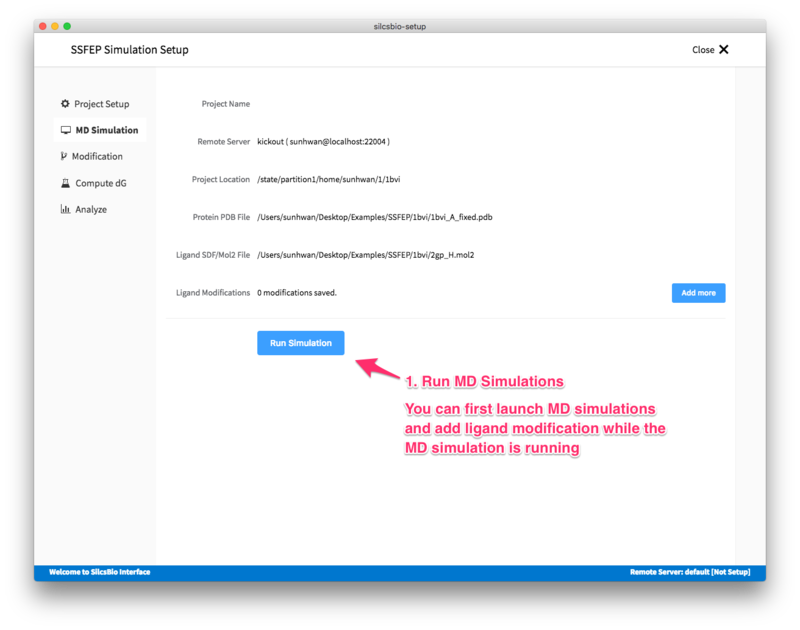 Your SSFEP simulation can now be started by clicking the “Run MD Simulation” button. Before running, you may wish to double check that you have chosen the desired directory on the remote server and that it has appropriate storage space. There are two parts to SSFEP: a compute-intensive MD simulation part and a very rapid dG calculation part. The compute-intensive MD may take several hours, and is only done once. The rapid dG calculation part relies on the MD results and is able to test thousands of functional group modifications to your parent ligand in under an hour. Should you wish to test additional modifications to your parent ligand at a later time in the project, there is no need to re-run the compute-intensive MD, which makes SSFEP a very efficient method. 10 MD jobs will be submitted to the queueing system (five for the ligand and five for the protein). Job progress will be displayed in this same window. The status of the job is also shown next to the progress bar: “Q” for queued, “R” for running, and “E” for finished. While your jobs are running, you can prepare your ligand modifications with the “Add Ligand Modification” button. This will show the parent ligand in the binding pocket. 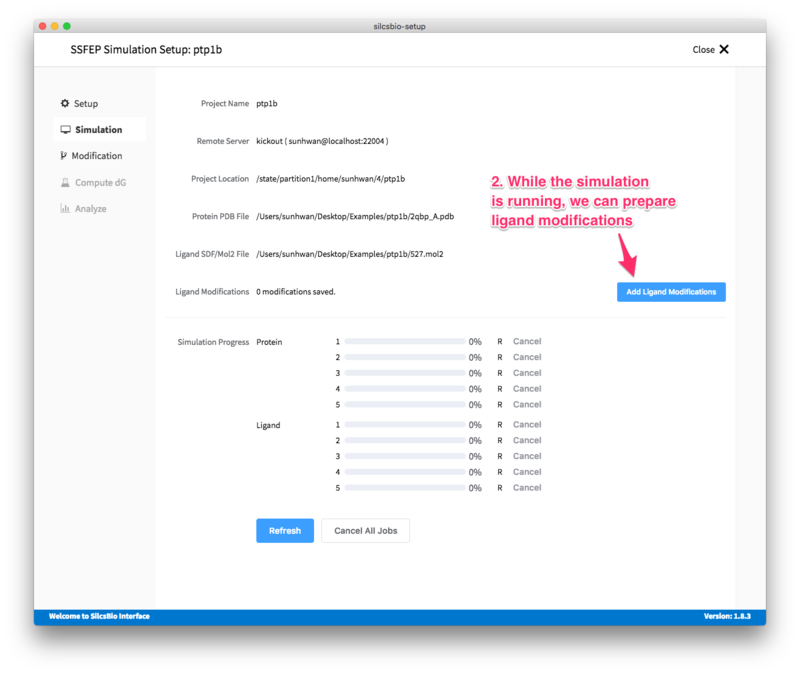 There are two major modification types, substitutions and replacement, available in the GUI. Substitution is used to substitute a hydrogen, a hydroxyl group, or a halogen in the parent ligand with another functional group. Replacement is used to replace an atom in a ring with another functional group that preserves the ring. The list of modification types in the GUI is extensive and covers a wide range of chemical functionality, and advanced users can make additional modifications through the command line interface. SSFEP is intended to evaluate small modifications. Larger modifications may take longer to evaluate and yield less reliable results compared to small modifications. To create a list of modifications, first select the atom to be modified. Then, select your desired modifications from the “Substitution” or the “Replacement” tabs in the right-hand panel. You may select multiple modifications for multiple atoms. Pressing the “Add” button in the panel will update your list of modifications, which is summarized in the “Review” tab. Use the “Review” tab to confirm your desired modifications. Valid modifications will have a small image icon as well as a small trash can icon. Clicking on the image icon will show the modification in the center panel. Clicking on it again will show the parent ligand. Clicking on the trash can icon will delete the proposed modification from your list. You can go back to the “Substitution” and “Replacement” tabs to add to your list. Once you have completed your list of modifications, you must press the “Save modification” button in the “Review” tab to actually save the list of modifications for your project. Once MD simulation is finished, the GUI will analyze your list of modifications and create a chart. SSFEP is designed to evaluate small modifications and results are best interpreted qualitatively. Therefore GUI-created charts indicate the change in direction of the binding affinity relative to the parent ligand. For additional details, please see Single Step Free Energy Perturbation (SSFEP).